The five most expensive home sales in South Florida within the last year involved hedge fund billionaires, homebuilders, a car salesman, a controversial news executive, a liquor company exec who doubles as a race car champion, and (of course) shadowy corporate entities. Collectively, the transactions amounted to $255 million. In all but one of those deals, the sellers had to compromise on their listing price by several million dollars. And they aren’t alone. Multimillion-dollar home prices are being slashed by potential sellers in exclusive neighborhoods across most of South Florida as more mansions continue to enter the market. Christopher Zoller, chairman of the Miami Association of Realtors and a broker associate at EWM International, sees this as a good thing. “Sellers are getting more realistic,” Zoller said. “The sellers are beginning to realize that if they want to sell, and not have their house sit on the market for more than a year, they might as well get realistic on prices. There are plenty of choices for wealthy potential homebuyers, Zoller said. As of April, there were 19.5 months of supply of homes listed at over $1 million in Miami-Dade. In Broward, there were 22.5 months of supply for homes over $1 million. In Palm Beach County, it was 15.7 months. And while there are many, many months of supply — typically, a market with more than six months favors buyers — closings for homes over $1 million were also up in a big way. Done deals increased 56 percent year over year in April 2017 in Miami-Dade County, and in Broward, $1 million-plus transactions increased by 8.6 percent compared to April 2016. In Palm Beach County, $1 million-plus home sales went up by 8.7 percent during the same period. Unsurprisingly, Palm Beach County is where some of the highest home-price sales were recorded this past year, including the off-market purchase of a of a mansion for $85 million — the second-highest recorded sale in the county’s history. Todd Peter, a broker with Sotheby’s International Realty, said Palm Beach’s luxury house market is far stronger than that of Miami-Dade or Broward, where rampant development has created an abundance of high-end condo and home inventory. “The oversupply of condos in Miami and, to a lesser extend, Broward … will take years to absorb, and it directly affects the luxury single-family markets,” Peter said. Jeff Levine, president-elect of the Realtors Association of Palm Beach and a broker-associate at Continental Properties, said he’s seen plenty of price decreases in Palm Beach County’s country club communities, which require equity buy-ins at $50,000 to $150,000. However, Levine insisted that the luxury market remains solid in the county, especially in places like the Town of Palm Beach, where lots start at $2.5 million. “Pricing is strong and will remain strong,” he said. 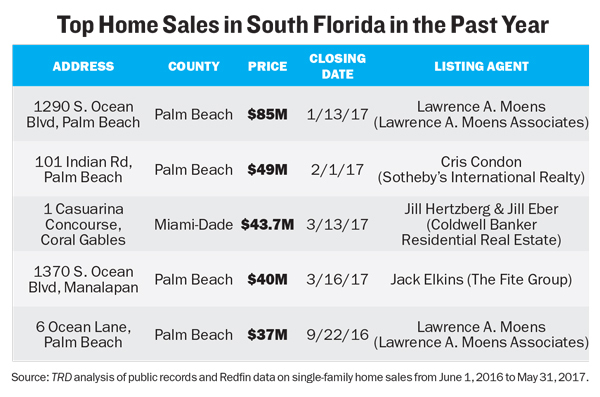 Of the five most expensive single-family home deals that were closed in South Florida between June 1, 2016 and May 31, 2017, four were in Palm Beach County. Three of those homes were in the Town of Palm Beach, the tony barrier island that has served as the winter home for some of the richest people in the U.S. ever since Henry Flagler began building exclusive resorts there in the late 1890s. And two of the five priciest home listings were represented by Lawrence Moens, a media-shy luxury real estate broker with his own firm who has sold mansions in the Town of Palm Beach since the late 1970s. Moens brokered the priciest home purchase of 2017 so far: a circa-1991 Bermuda Georgian house at 1290 South Ocean Boulevard. In 2005, Paul Saville, CEO of homebuilding and mortgage company NVR, and his wife, Linda, bought the 17,871-square-foot house on 4.18 acres for $32 million. Their house wasn’t on the market. However, hedge fund billionaire Ken Griffin owned four lots next door to the Savilles and wanted their property to build a 55,800-square-foot mansion that would be 405 feet long. So Griffin paid $85 million for the Savilles’ property in January. The house, meanwhile, is slated to be demolished. In Palm Beach history, only one mansion transaction was pricier: Russian billionaire Dmitry Rybolovlev’s purchase of 515 North County Road from future President Donald Trump for $95 million in July 2008. The second most expensive mansion transaction in South Florida in the 12-month period surveyed was also in Palm Beach. Last year, developer Robert Fessler completed a 28,500-square-foot spec home at 101 Indian Road on land he had purchased for $14.4 million back in 2012. He immediately listed it at $55 million in February 2016, then bumped up the price to $59 million that same year. It was ultimately sold this past February to Michael Resnick, a trustee of the Indian Road Land Trust, for $49 million. Cristina Condon of Sotheby’s International Realty represented Fessler, while Christian Angle of Christian Angle Real Estate represented the buyers. It isn’t clear if Resnick, the co-founder of Illinois-based wealth management firm Tallwoods Partners, is the actual owner. Also sold at a discount: 1 Casuarina Concourse in Coral Gables, the only house in South Florida’s top-five priciest deals outside of Palm Beach County. It was owned by automobile dealership magnate Alan Potamkin, who built the 10-bedroom, 20,862-square-foot home on a Biscayne Bay-fronted lot that Potamkin bought for $2 million in 1987. The house’s features include a 1,500-bottle wine room, a corporate office with a private bath, three fireplaces and an aviary. In May 2015, Potamkin listed the property for $67 million with The Jills, aka Jill Hertzberg and Jill Eber of Coldwell Banker. It finally sold for $43.7 million in March. Edward Brown had to make a deal to sell his home, too. Brown, the CEO of Patron Spirits and a part-time race car driver, bought Casa Brisas, a 32,091-square-foot house at 1370 South Ocean Boulevard in Manalapan in Palm Beach County, for $15.6 million in December 2012. Three years later, Brown listed the house and 3-acre waterfront parcel for $37.5 million. Then, last summer, following a renovation project that lasted more than three years, Brown upped the price to $48.9 million. The nine-bedroom house (not counting the 1,500-square-foot walk-in closet) was featured in a CNBC spot entitled “The $48.9 million house that Patron built,” which marveled at Casa Brisas’ underground man cave and the Patron bottles in every room. This past March, Casa Brisas was purchased for $40 million by Borogove Limited, a London-based company connected to researcher Mary Christine Anne Henley. The fifth-priciest sale in South Florida was a new 12,741-square-foot home at 6 Ocean Lane in Palm Beach. Back in December 2013, Boca Raton homebuilder Mark Timothy Pulte bought the waterfront site from Egyptian-Canadian pop singer Chantal Chamandy and her entrepreneur husband for $12 million. Pulte then built a two-story, six-bedroom spec house with retractable glass walls. In January 2016, Moens listed the house for $42 million. It was bought last September by City National Bank of Florida for $37 million. Rumors soon circulated that the home’s true owner was former Fox News CEO and Chairman Roger Ailes. Those rumors were confirmed by the Palm Beach Post in April, less than a month before Ailes died. It’s now owned by his widow, Elizabeth Tilson. Jorge Uribe, a senior vice president at ONE Sotheby’s International Realty, knows what he must do to get attention for his Key Biscayne listing: cut the price. Uribe is listing 400 South Mashta Drive, a six-bedroom home owned by tech and real estate investor Aurelio Fernandez and his wife, Berta. The property was originally listed for $39 million last August, and this past May, the price was lowered by $5 million. The Fernandezes built the house in 2003 after purchasing the 36,355-square-foot lot for $3.6 million. The Key Biscayne house is merely the fifth-highest price cut of the year. The steepest cut? That’s the price for 1071 North Ocean Boulevard in Palm Beach. It was originally listed for $84.5 million in March 2015. The price was then knocked down to $74.5 million in February 2016 before it was delisted. This past May, the 32,661-square-foot beachfront house was listed again, this time at $64.9 million. The house and 2-acre property are owned by Vahan Gureghian, CEO of CSMI Education Management, and his attorney wife, Danielle. The couple first listed it while the home was still under construction. The second-highest price cut of the year is 615 Lido Drive, a 15,950-square-foot home in Fort Lauderdale’s Las Olas neighborhood. After being listed for nearly 11 months, its price was slashed from $40 million to $27 million in January. An LLC connected to Michigan engineering consultant Wayne Jones bought the house and 1.3- acre site for $7.4 million in 2005. The third-highest price slash is 1485 South Ocean Boulevard in Palm Beach. Built in 2000, the 22,164-square-foot mansion served as a home of real estate investor and banker Damon Mezzacappa until he died in April 2015 at 79. Six months later, it was put up for sale for $67.5 million. The estate has since reduced the price to $59.5 million. And the price of Casa Bahia, the 13,483-square-foot Coconut Grove home of film director Alejandro Landes in Miami, shrank by $7 million in February after being on the market for less than five months — the fourth-highest discount in South Florida. The nearly 1-acre lot was bought by Landes and other family members and partners for $3.29 million in 2004.